Big thank you to Chris for this ? ESNU, Umeå Airport, located in the northern part of Scandinavia is the 7th largest airport in Sweden. It's visited by airlines such as Aegean Airlines, BH Air, BRA Braathens Regional Airlines, Direktflyg, Finnair, Norwegian Air Shuttle and Scandinavian Airlines. It's also home to various GA activity, skydiving as well as a carting track. ESNU have one runway, 14/32, 2295 meters long. The height above the sea is 7 meters. The airport contain multiple custom buildings but also minor objects from librarys like OpensceneryX and MisterX. This is our first release and we intend to improve this airport over time. OBSERVE The airport s built to resamble how the REAL airport looks like today and how it will look like. 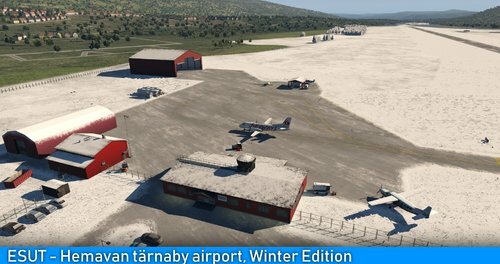 There are changes being done to the airport and the first one that is noticable is the apron configuration, which has changed to that what you see in the simulator. This change is so new that it is not even in the AIP yet. Still, this is how you park your airplane today. Let me know if anyone needs assistance. --------------- Requirements - X-plane 11.10. 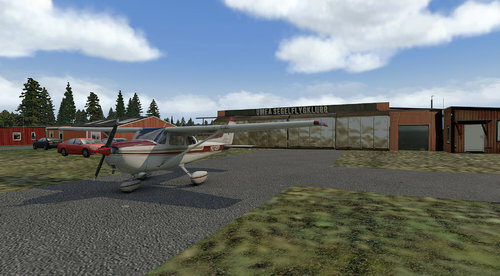 - A GFX card with at least 2 GB of RAM - MisterX Library and static aircraft extension 1.51 https://forums.x-plane.org/index.php?/files/file/28167-misterx-library-and-static-aircraft-extension/ - OpenSceneryX 2.1.1 https://forums.x-plane.org/index.php?/files/file/2226-opensceneryx/ - World models library 0.8.0 https://forums.x-plane.org/index.php?/files/file/32135-world-models-library/ --------------- Recommendation: Download the newest Airport Environment HD and W2XP Sweden 1 for full immersion. --------------- Installation Place the DSC_ESNU folder in to your X-Plane 11/Custom Scenery folder. For 4k ground textures, download images.rar and extract its content inside images folder of the DSC_ESNU scenery. --------------- License No part of this airport can be used or redistributed without first gaining permission from the related owner. --------------- Developers: Daniel Martinsson & Dragoljub Blagojevic Credits A big thank you to Andrew Masse for his texture work and Anders Högqvist for his fantastic bridge! Thanks to www.textures.com and www.poliigon.com for a being two great texture sources. Another thanks goes to the members in the Flightsim Sweden community for the help and support and countless others who helped us along the way!